Terrariums and indoor hanging baskets are trending in houseplant design, and the baby tears plant is an eye-catching specimen suited for both container types. What makes baby tears plants so special are the myriad tiny leaves, which form a dense mat suggestive of a gnome's green paradise. Although baby tears plants are easy for beginners, they require regular attention to look their best. The delicate appearance of baby tears plants does not mesh with their vigorous growth habit. In fact, in mild climates with regular rainfall, the plants can be weedy or even invasive. A member of the nettle family (Urticaceae), baby tears plants were first brought into the plant trade by botanist Joseph François Soleirol, who collected specimens in Corsica and is responsible for the plant's Latin name. Baby tears plants will take brief periods of intense sunlight, but look their best in bright, filtered light. Plants growing in full sun may develop brown, scorched leaves. Baby tears plants can thrive under artificial lights indoors. A rich soil amended with humus, compost, or manure will increase the nutrients available to baby tears plants, and will also help to regulate the moisture level for plants. Any commercial potting soil is suitable for growing baby tears as houseplants or in containers. Baby tears plants are thirsty, and never like to dry out. If your plants do dry out, you'll notice a dramatic wilting take place. Water them quickly, and within a day they should recover. Baby tears houseplants will require slightly less water in the winter months. It's fine for the soil's surface to be dry, but the soil around the roots should feel slightly moist. As an outdoor plant, baby tears grows best in temperatures of 50 to 70 degrees F. The higher the ambient temperature, the more attention the gardener must pay to light and humidity. Baby tears plants can tolerate a light frost, but freezing temperatures may kill the top growth of the plant. Be patient; it will come back from the roots in zone 9. Baby tears plants appreciate a high humidity level. This makes them ideal for a steamy bathroom or kitchen. In drier environments, the plants appreciate the humid confines of a terrarium. A balanced plant fertilizer will keep the foliage of baby tears plants bright green and dense. Liquid fertilizers are easier to apply than spike inserts when no bare soil is visible. Baby tears plants grow quickly, and need to be repotted regularly. Pot-bound plants are more susceptible to drying out, and you'll notice an increased occurrence of wilting in plants that need to be repotted. Because the stems are so fragile, you must not pull plants out of their containers by the stems or leaves. Turn the pots upside and tap them, squeeze them, or push on the drainage hole with a pencil to coax the plants loose. Repot with commercial potting soil, and water thoroughly. Baby tears plants propagate easily, too easily in some circumstances. Wherever stems are touching the soil, they will form roots. Plants can spread without limit in this fashion. If you wish to create new plants for different containers, separate a section of stems with soil and roots with a small trowel. Don't worry about damaging the plant, it will regenerate quickly. Replant the division and keep it watered, and it will start to grow without skipping a beat. The standard green species of baby tears is most common in the trade. However, there are two color variants available, including 'Aurea' with golden foliage, and 'Variegata' with white stippling. The green color is dominant across all varieties, and you must prune away any green stems in the gold and variegated types to prevent them from reverting to solid green. The ASPCA shares that baby tears plants are non-toxic to dogs, cats, and horses. According to the University of California, Davis, baby tears plants are generally believed to be safe for humans. However, although eating a small amount of a plant may be safe, eating large or frequent amounts can be harmful. Baby tears plants are not considered edible in any quantity. It isn't necessary to prune baby tears plants for good health, but they respond to a shearing much in the same way a person with waist-length hair benefits from a trim: thin, wispy ends that no longer add to the beauty of the whole are removed. 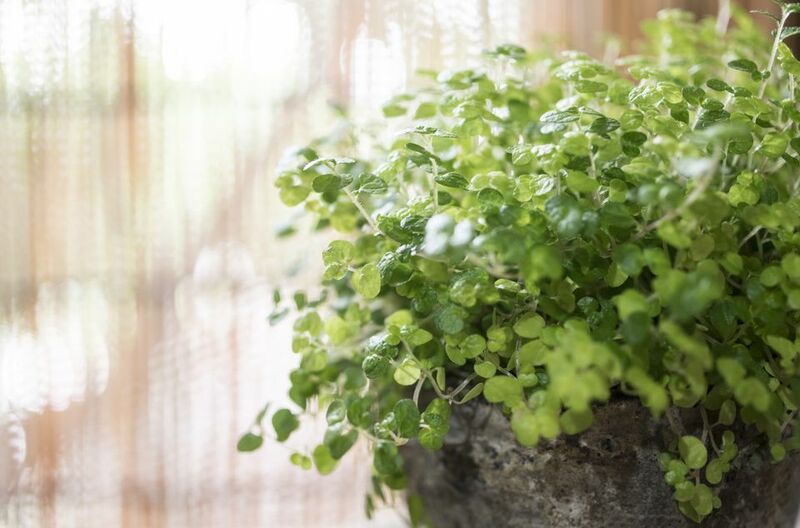 When you grow baby tears as a companion plant to an African violet, peperomia, or other houseplant, you might want to give it a trim to keep it in bounds. Pruning is especially prudent in small terrariums. The cute juvenile plant with dainty leaves can quickly overrun other miniature plants in a confined space. The container grown baby tears plant is best for those living in cold climates, as well as those who live in areas where the plants are invasive outdoors. A commercial potting soil lightened with peat moss or perlite provides a healthy growing medium for plants. Baby tears plants work well in a variety of container situations. In a small hanging basket, the spreading plants can spill attractively over the sides. In a terrarium, the plants can creep to the edges of the glass, hiding all bare soil. In a mixed outdoor planting, place baby tears plants at the edge of the container, in combination with mounding plants like impatiens and tall plants like coleus that thrive in the same light and moisture conditions. Baby tears plants are sometimes confused with moss plants, especially Irish moss (Sagina subulata). From a distance, both plants exhibit the same bright green foliage and low-growing characteristics. They also both produce tiny white flowers. However, Irish moss has very fine, thread-like foliage, which differs from the teardrop-shaped leaves of baby tears. Irish moss also likes moist soil and partial shade, but it's hardy down to USDA growing zone 4, and works better as a landscape perennial rather than as a houseplant.